I’m always interested in rare, old instruments. We most often hear about priceless stringed instruments, such as Stradivari, Amati and Guarneri violins, violas & cellos. Or perhaps the occasional harpsichord or early fortepiano. But a wind instrument made out of rock crystal? Not so often. However, this past week, museum goers in Valparaiso, Indiana got to hear about, AND hear played, a 200-year-old crystal flute. NWI The Times’ Porter County Editor John Schiebel shared this story. A rare 200-year-old crystal flute was on center stage Thursday afternoon at the Porter County Museum. 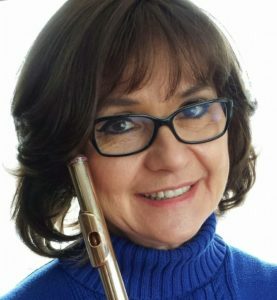 Debra Silvert, of Valparaiso, presented a lecture-demonstration titled, “An 1816 Flute – Crystal Clear”. The flute, a four-keyed instrument, was built in 1816 in Paris by Claude Laurent. Slightly more than 100 of his instruments are known to still exist, and only 24 are privately owned, according to Porter County Museum officials. Silvert talked about the history of flute making and how the 1816 instrument differs from the modern flute. Megan Telligman, Porter County Museum communications coordinator, said the age of the instrument coincides with the state’s bicentennial. The history of the origin of the flute provides an example of what was happening around the world when Indiana became a state. Silvert, is a professional flutist who has performed around the world with Duo Sequenza, along with classical guitarist Paul Bowman. Silvert said she became acquainted with crystal flutes after visiting an exhibit at the Library of Congress more than 30 years ago. Soon afterward, her husband purchased the 1816 Laurent flute for her. She said she treasured the flute, but did not play it much until she was encouraged to learn to play it at the 2014 National Flute Convention. She said the flute had only minor flaws. A pad was replaced in 2015, and one spring recently had to be repaired. Silvert said the flute is quite different from modern flutes, with fewer keys among the differences. Because it’s made of crystal, she said it’s heavier than modern flutes. Silvert said she had to teach herself how to play the instrument, and has reached out to experts on antique instruments to learn more about the flute. “The fact that it’s a completely intact flute that actually plays is pretty rare,” she said.